Edited by Barry Levy and Victor Sidel. 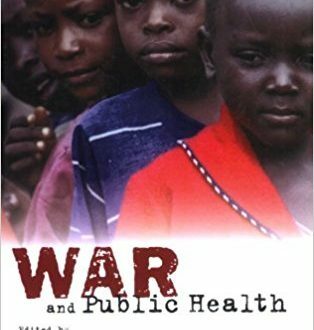 An examination of the relationship between war and public health, documenting the public health consequences of war and describes what health professionals can do to minimize these consequences and even help prevent war altogether. Explores the effects of war on health, human rights, and the environment. The health and environmental impact of both conventional weapons and weapons of mass destruction–nuclear, chemical, and biological weapons–is described in chapters that cover the consequences of their production, testing, maintenance, use, and disposal. Separate chapters cover especially vulnerable populations, such as women, children, and refugees. In-depth descriptions of specific military conflicts, including the Vietnam War, the Persian Gulf War, and wars in Central America provide striking illustrations. A series of chapters explores the roles of health professionals and of organizations during war, and in preventing war and its consequences. Read more.